to come and experience the Chapel of Saint John the Divine for yourself. We promise both to give you space enough to see if the way of faith that we practice is for you, and to walk the journey alongside you. Church in this day and age is about creating real relationships, and having tangible experiences of faith alongside others. Come and see if the Chapel is right for you. We are a hospitable and welcoming group of Christians who gather to worship, learn, discuss current issues from a Christian perspective, serve the community through outreach, and follow the Risen Christ. is a dynamic campus-based ministry, enriched by the inclusive atmosphere of the university community. There is a wide variety of people here: town and gown, indigenous and international. 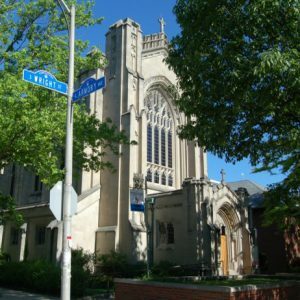 grew up in the Episcopal Church; many of us come from another denominational background. Others are new to the church altogether. We accept and welcome people from all places on their spiritual journeys. Coming from such different backgrounds, we have many perspectives on liturgy, the Bible, and current issues on campus, in our city, and in the world. As a community, we work to ensure that these differences become a strength. We seek to reach out to meet others’ needs in God’s unfolding plan for us. We are grounded in the Way of God in Christ, shared in teaching and learning. We enjoy the challenge of using our brains and hearts. We accept that there are not easy answers for everything, and pray to God to help us ask better questions. 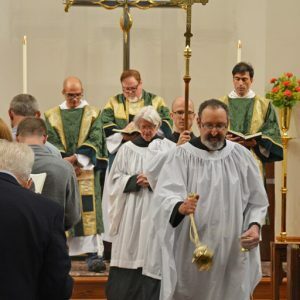 a sacramental and liturgical church and worship is at the heart of everything we do. Regular worship services are held on Sunday mornings, at 8:00 and 10:00, and Wednesday evenings at 5:15 each week. Christian Education (Sunday School) is held each Sunday morning following the 10 am service. the time honored Anglican practice of holding Scripture, Tradition, and Reason as the cornerstones of our faith and life. 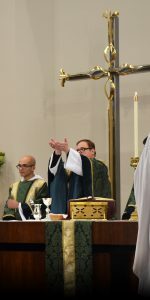 We practice a weekly Sunday celebration of the Holy Eucharist (the Lord’s Supper, Mass, Holy Communion). 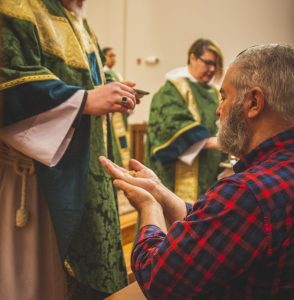 The Episcopal Church (and the Chapel specifically) invites all Baptized Christians (of any age) to receive the sacrament of Holy Eucharist, regardless of denominational background. We invite you to participate in worship to any degree with which you are comfortable. Follow along, or simply concentrate on what is being said and sung. Everything we say is included in the leaflet for your ease of use in the service itself. 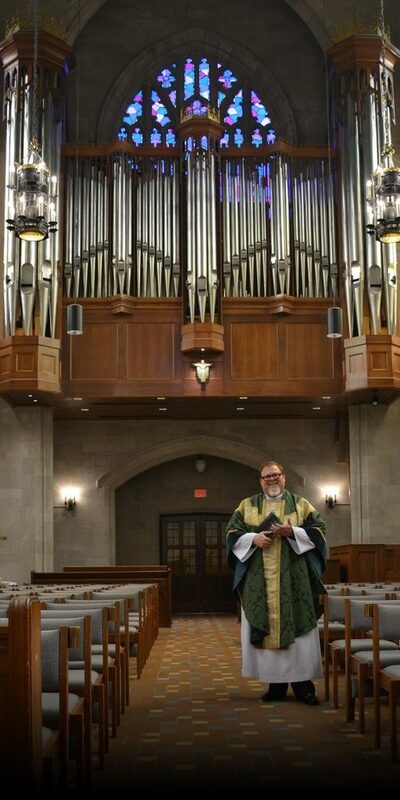 In it you will find the liturgy, readings, and the service music. Page numbers for hymns are also included. Worship at the Chapel engages all our senses. We move our bodies; we lift our voices in song and prayer; we listen to the words and musical offerings. We see the liturgy unfold in all its color and meaning; we smell the fragrance of incense rising with our prayers. We are involved! Children are an integral part of the life of this parish church and are always welcome at all of our services. We invite your children to worship with us. We also provide a nursery for those 0-4 and children’s church for those who are 5-9, if you find having them with you distracts you from worship. Plan to experience Sunday worship with us. We are sure to be enriched by your presence. The Chapel is an historic parish and university chaplaincy and while we are proud of our roots and heritage we are also excited about the community we are now and the one we are becoming. Come and experience the Chapel of Saint John the Divine. It won’t be the same without you!